Opine Gym: I love the American Cup! And other gymnastics thoughts. I love the American Cup! 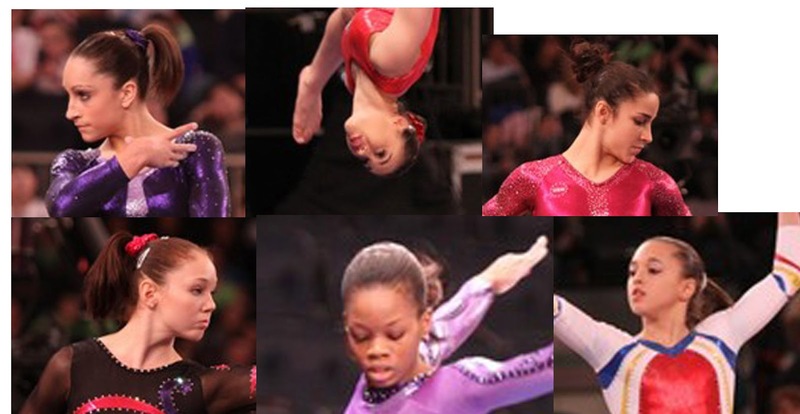 And other gymnastics thoughts. Once again, if not for my trusty DVR, I might have missed the broadcast altogether! The American Cup is always great to watch, I'm reminded, after browsing past routines on YouTube, just how fantastic it is to view gymnastics in high definition. Aly Raisman, I like you more and more! Your tumbling is just a joy to watch. BUT. If you can have such lovely form mid-flip on floor, you can also do it on bars. Get it together! Gabrielle Douglas seems to be peaking at just the right time! Which is great for her and great for me because I've been singing her praises all along and I love it when I'm right. Plus, she looks great in purple. And I love purple. Hooray! Tim Daggett, if you haven't got anything nice to say, don't say anything at all. Everyone knows Rebecca Tunney was not here to run away with the competition. There's no need to be ugly. Her poor little beam routine was obviously a disaster but at a certain point critique becomes cruel. Tell the audience what's gone wrong, but then explain that she's there to represent the Olympic host country and is not expected to win. The end. (At some point I'm sure the video of her beam will appear online, and you can judge for yourself how unnecessarily mean he was). I don't post about men's gymnastics very often. But how exciting is Danell Leyva? Let's call him Sideburns. We also got to see this clip of Sideburns at 2011 Worlds. The only thing that can make a nasty fall nastier is spitting out a tooth in super slo-mo. I mean, I get it. Sometimes the look you're going for is messy-casual, I'm-too-cool-to-care hair. But there's a time and a place for Sunday-morning-frat-house-walk-of-shame hair, and a big time gymnastics meet is not it. Also, I'd almost prefer a scrunchie to a ribbon. There's something incongruous about bed-head hair with kindergarten hair accessories. I'm not trying to be mean-spirited here. I'm just saying, you've worked hard to get here. Dress up for the occasion. Where was I? Oh yes. American Cup. Nice routines, nice hair, nice Olympic preview. Jordyn Wieber is the one to beat.